With his teaching career derailed by tragedy and his slacker days numbered, Webster Fillmore Goodhue makes an unlikely move and joins Clean Team, charged with tidying up L.A.'s grisly crime scenes. For Web, it's a steady gig, and he soon finds himself sponging a Malibu suicide's brains from a bathroom mirror and flirting with the man's bereaved and beautiful daughter. Then things get weird: The dead man's daughter asks a favor. Every cell in Web's brain tells him to turn her down, but something makes him hit the Harbor Freeway at midnight to help her however he can. Soon enough it's Web who needs the help when gun-toting California cowboys start showing up on his doorstep. What's the deal? Is it something to do with what he cleaned up in that motel room in Carson? Or is it all about the brewing war between rival trauma cleaners? Web doesn't have a clue, but he'll need to get one if he's going to keep from getting his face kicked in. Again. And again. And again. 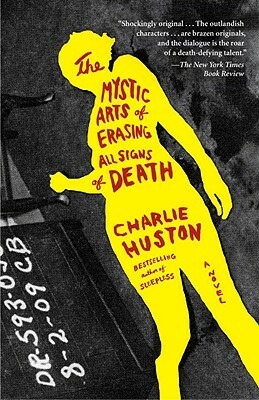 Charlie Huston is the author of The Shotgun Rule, the Henry Thompson trilogy: Caught Stealing, Six Bad Things (an Edgar Award nominee), and A Dangerous Man, and the Joe Pitt novels: Already Dead, No Dominion, Half the Blood of Brooklyn, and Every Last Drop. He lives in Los Angeles with his wife, the actress Virginia Louise Smith.